I have a complicated relationship with capitalism, and I hate shopping. For these reasons and others, every year I feel pretty good about celebrating Buy Nothing Day on the day after Thanksgiving. This year I’m still buying nothing. But there’s an extra urgency this year, an urgency marked by protests in many cities across the country. I look at my son and wonder how parents of black boys do it, how they explain and discuss the events of the past weeks months years, and my heart aches for them. We discuss these events in my house too, but we will never know how it feels, because we will never not know the privilege of our skin color. The dinner’s been consumed (dessert too), and Gus is in hog heaven: playing Link’s Crossbow Training on my BIL’s Wii w/surround sound. We had some iconic fall moments this afternoon raking leaves so Gus could jump into a pile of them a la Charlie Brown Thanksgiving (“never jump into a pile of leaves with a wet sucker”). AND we didn’t even hit traffic on the SIE and NJT today. Much to be thankful for! 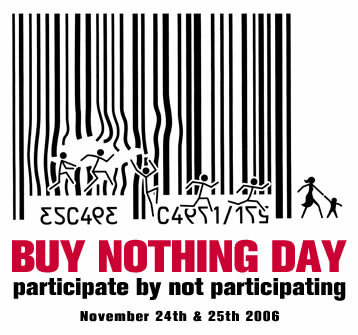 Don’t forget, tomorrow is Buy Nothing Day! Sadly, tomorrow we might actually have to buy something, since it’d be rude to eat all of my sister’s food + not pick up dinner in exchange for crashing at their pad. But dinner’s hardly frivolous, so I think we get a pass on that. Last xmas my mom got Gus a couple of fairy tales on tape for the car. We hadn’t listened to them in ages but pulled them out again recently in a desperate attempt to keep him awake on the ride home from school (which is only 15 min long but they run ’em hard in kindergarten so he is often exhausted). Gus’ favorite tape is read by Margot Kidder. He especially loves Puss in Boots, The Frog Prince and The Brave Little Tailor. Ms. Kidder actually does a great job reading the stories, even breaking into a few different voices for each character*. We’ve found ourselves spontaneously breaking out in pieces of the stories around the house: e.g. “Youngest princess! Keep your promise to me youngest princess!” in a froggy voice. * The other tape is read by Ed Begley, Jr., who is somewhat more sleep-inducing and less entertaining. 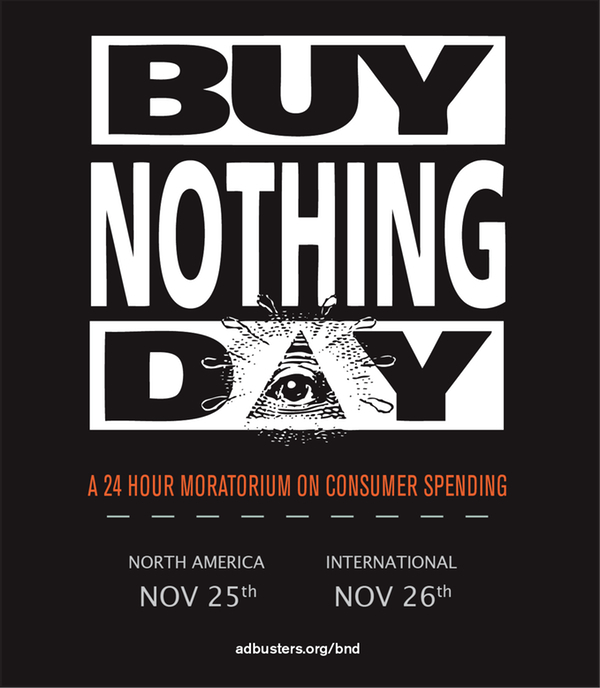 Hey, it’s Buy Nothing Day — don’t forget to fight the consumerist agenda, you stinky hippie! At least we remembered to tape it last weekend. The prior weekend we’d forgotten and thus spent the ENTIRE day recounting the episodes to him: “Mommy, tell me about Fergus* and the smelter again.” After the 5th rendition I was seriously ready to rip my head off. Thank god for VCRs. Or maybe not, because now the damn theme song is on endless loop in my head. Shoot me now. *Little does he know that this is the very name I really wanted for his little highness, but Jonathan shot it down. Happy Thanksgiving! Not that any meal cooked by Jonathan and my mom is ever anything less than extremely tasty, but this year’s was particularly yummy and fairly healthy to boot. Turkey, stuffing (with bacon! ), sweet potato fries, kale (with bacon! ), cranberry sauce, sauteed mushrooms (with bacon! ), roasted squash (I think delicata? ), creamed onions (eeewww, for my mom + J), brussels sprouts (for J only, with bacon!). YAY for bacon, I say. Now there’s a meat to be thankful for. 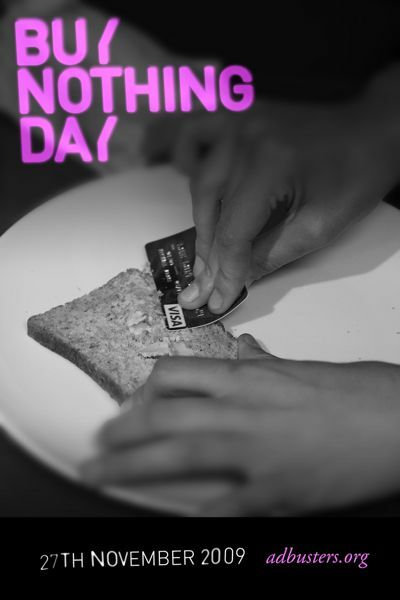 Tomorrow is Buy Nothing Day. Live radical — spend no money!